Convert raw, Ni, crop, duplicate layer, blending options overlay, desaturate, invert, blend options overlay, gaussion blur, curves top layer, master opacity change 32%,merge visible, layer via copy screen 50%, layer via copy multiply 75% Middle layer, merge visible, copy via layer, glam blur, desaturate layer 1, curves layer 1, variations layer 1, master opacity change, dodge, burn, spounge (saturate), unsharp mask, merge, shadow/highlight, copy via layer, Ni, master opacity change top 60%, color balance bottom, merge visible, dodge, image size, unsharp mask, save for web. Wonderful execution and perfect title. My parents did a similar portrait years ago. A top 10 entry in my book. Wow, this one is awesome! I would have picked this to be a frong pager for sure! Great shot. Very crispy and great compositon. Very nice photo. I like the overall tones of the woody's and the leaves. The light is nice too. Excellent! WOODn't change a thing! Doesn't quite give me a portrait feel. But it is a rather well done image. The lighting is even and the colours are nice. But still missing something extraordianary. But still a great image. I like the colors here and the setting. ha ha These are cracking me up. GREAT lighting. Very nice causal portrait of a couple of good looking Woodys. A deep conversation I guess.... Well done. Nice lighting and composition. A favorite of mine! It's kind of scary that you can make a wooden doll show emotions. Very nice setup and processing on this. 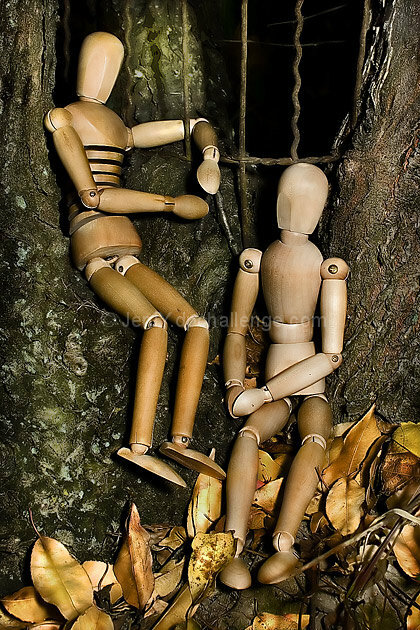 Definitely a sense of intimacy here, and that you managed to do that with wooden figures says a lot. Great job. Proudly hosted by Sargasso Networks. Current Server Time: 04/24/2019 03:52:29 AM EDT.